You can have friends from your support circle with you to help you choose the right wig for you, so that you can feel confident. Many women think that human hair wigs will be more natural looking. They fear that “synthetic” wigs will look synthetic. This is not true! Each type of wig has its own unique benefits. Synthetic wigs are the most popular because they require the least amount of care. 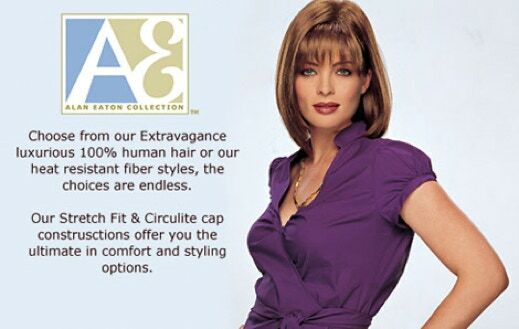 Today’s synthetic wigs offer more styling choices, colors and unique comfort features. Shorter synthetic wigs are considered “shake-n-go,” meaning that all you do is shake them out and they look great. Longer styles simply need to be combed or finger-styled. Synthetic styles are easy to pack and take with you, and the fiber is resistant to humidity, so your style holds in any weather. One thing that’s important to remember is that you never use heat on a synthetic wig! Any heat source, such as a blow dryer – even an open oven – can damage the fiber and ruin the wig. Human hair wigs are extremely versatile. You can curl and style them as you would your own hair. However, since they do not come pre-styled, they require more effort than synthetic wigs. They also tend to be a bit heavier and thicker, and may need to be trimmed to suit your features. Most stylists recommend sticking with synthetic styles, which can save you both time and money, since human hair is more expensive. Human hair wigs are only a good idea if you are particularly skilled at styling your own hair, and don’t mind doing it every day. Call and schedule your appointment with Pat or Mindy today.